The National Farm to Preschool Subcommittee has begun a national E-news publication that is published monthly and our MI Farm to School Grant Program has been featured this month! Check out below and check the website for a highlight in the "News" section. 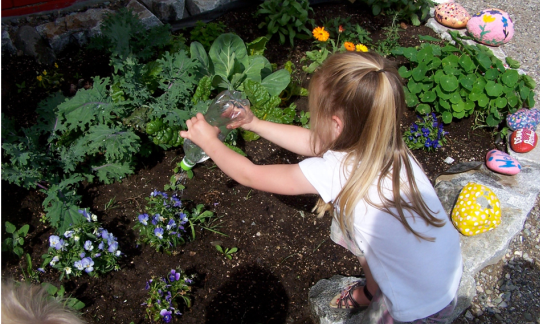 In this photo: Preschoolers in Alaska water their garden with plastic water bottles pulled from a recycle bin. Do you have tips and tricks for gardening with preschoolers? See below, and send them our way! Photo courtesy of Denali Preschool and Learning Center Garden Camp. Inspired by Farm to Preschool across the U.S. The Farm to Preschool Subcommittee of the National Farm to School Network had the opportunity to meet and learn from almost 800 conference attendees at this year's Farm to Cafeteria Conference. We shared a bit about our work, including the results from our national Farm to Preschool survey, and we were inspired by the work and enthusiasm of many of you who attended. You can view the Farm to Preschool workshop PowerPoint from the conference, which includes additional information, case studies, and information about each Subcommittee member, here. Many of you asked for lesson plans and curricular resources when you filled out the Farm to Preschool survey. Many others gave us suggestions for the curricula you like best. We've compiled your responses below, and hope you'll check out these great resources! And don't forget to visit the curricula page of www.farmtopreschool.org for more information. Nine out of 25 grantees of Michigan Farm to School Grant Program 2012-2013 grants were awarded to child care programs. This is the first year that Farm to Preschool programming has been supported through the W.K. Kellogg Foundation-funded MI Farm to School Grant Program. Though this funding was originally established to support Farm to School in K-12 schools and districts, emerging interests around the state in Farm to Preschool efforts facilitated this year's additions! Other states around the country are beginning to do the same, such as Texas. Check your state Department of Agriculture, state-based Farm to School grant programs or the Farm to Preschool website to see if child care is included in your state. We are excited to see Farm to Preschool recognized in these funding streams! You are receiving this email because you are subscribed to the Farm to Preschool Subcommittee enews list. Unsubscribe from this list. Block all communications from Ecotrust.